Louis Jules Duboscq (1817-1886) was a French instrument maker, inventor, and pioneering photographer. 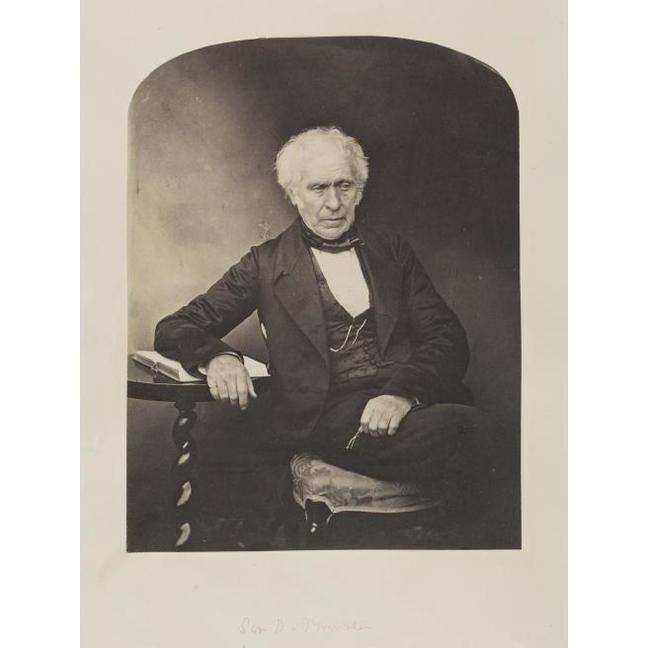 Apprenticed in 1834 to Jean Baptiste Françoise Soleil, a Parisian optician, he later married one of Soleil’s daughters and went into partnership with his father-in-law, forming the company of Duboscq-Soleil. Duboscq produced several significant optical items (either making or improving on others’ designs) including the ‘Lanterne Photogénique’ for viewing microscopic documents, and the early animation device known as the stéréo-fantastique or ‘Bioscope’. 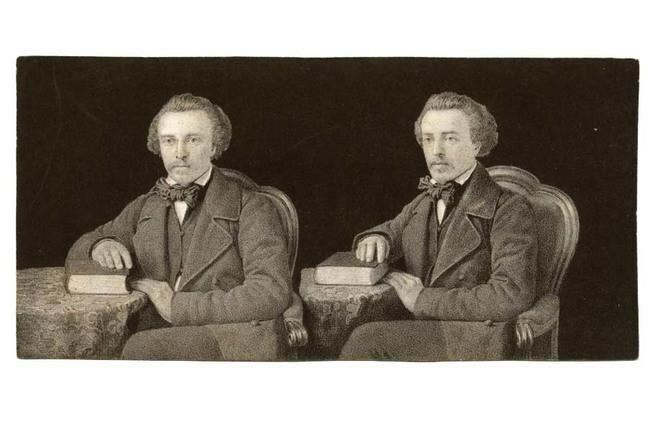 Scottish inventor David Brewster, disheartened by an indifferent reception in Britain to his improved lenticular stereoscope, offered his new portable design to Duboscq in 1849, who immediately saw its potential. In the words of one commentator - the Abbé Moigno - Duboscq created a viewer of such beauty that it attracted ‘a spontaneous and unanimous cry of admiration’ (Brewster’s translation) from all who saw it. Much of this material reflected the scientific interests of mid-century Paris, and the circles in which Duboscq moved. 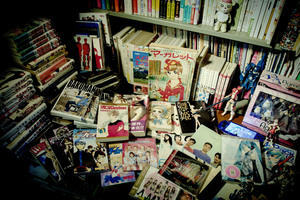 These were sold by a variety of shops in both London and Paris. 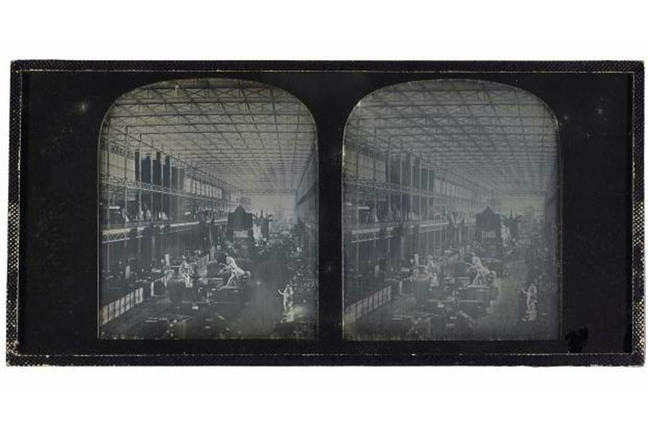 Stereoviews proved to be crowd pleasers at the 1851 Great Exhibition in London and Queen Victoria in particular was fascinated by this new innovation. 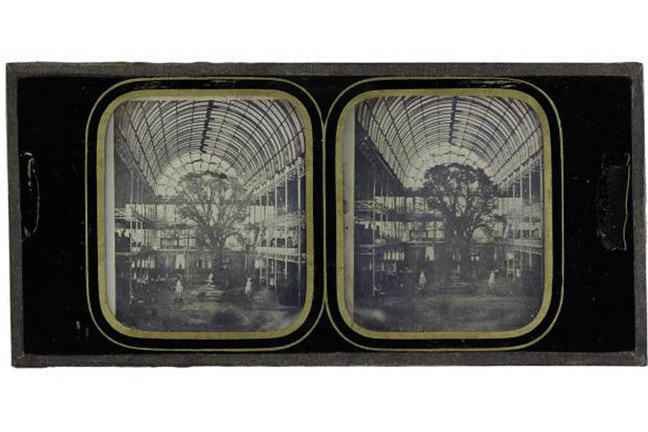 Antoine Claudet and John Jabez Edwin Mayall (who made the first carte-de-visite of Queen Victoria) were among the other prominent photographers who showed stereoscopic daguerreotypes at the Crystal Palace. Some of the earliest stereo-daguerreotypes, unusual survivals, show different views taken inside the Great Exhibition itself. The image below shows, in the north aisle, one of the elm trees which was incorporated into the design of the building to avoid being cut down. The image is stamped on the back with the monogram ‘DS’ for the family firm of Duboscq-Soleil. 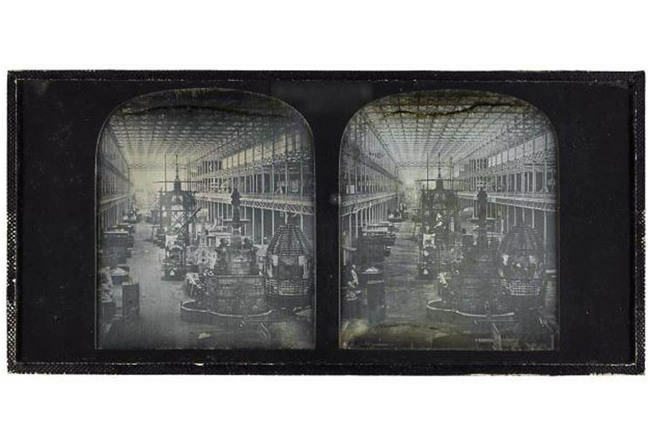 Two others show views to the east and west, with the nave filled with exhibits: they may have been taken by TR Williams (1824-71), a photographer who went on to be employed by the London Stereoscopic Company, before working for himself. We will look at TR Williams in Week 2.